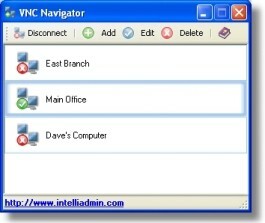 VNC Navigator 2.0 is remote computing software developed by IntelliNavigator, Inc. This program allows you to easily manage your VNC servers. It supports RealVNC, TightVNC, and UltraVNC. Connect to servers with just a double click. It keeps your passwords safe in a 256 Bit encrypted database. This network & internet software is shareware, which means you can download and use VNC Navigator 2.0 for free during the trial period (usually for 30 days). At the expiration of the period you will have to buy the remote computing product for $59.00. VNC Navigator 2.0 is available at regnow and IntelliNavigator, Inc website. VNC Navigator 2.0 supports different languages (including English). It works with Windows XP/Vista. We have tested VNC Navigator 2.0 for spyware and adware modules. The software is absolutely safe to install. We has completely tested remote computing software VNC Navigator 2.0 many times, written and published the interesting article and uploaded installation file (987K) to our fast server. Downloading VNC Navigator 2.0 will take several seconds if you use fast ADSL connection. Atchoo is the ultimate Carracho utility! It allows you to quickly and easily keep a list of your favorite Carracho-servers and connect to them. WordSafe 2.0 is a high security encrypted password database. Private servers are servers that do not require the validation of a cd-key while playing.